Supposedly, it is based on a “true story,” but even “inspired by” would be overstating matters. Chinese telecom giant Huawei has been accused of secretly installing backdoors in their products at the behest of the Mainland intelligence services. They have been accused of using bribery and strong-arm tactics to win contracts in the developing world, as well as doing end-runs around China’s labor laws. Obviously, they are the good guys. That is probably why even local audiences took a pass on Tan Bing’s China Salesman (trailer here), which opens this Friday in New York. He has been dispatched to assist stalwart division head Ruan Ling during the bidding process. Yan will be handy to have around, because he apparently serves R&D, sales, marketing, and IT functions at DH. Of course, the evil westerners want to stop them, so they contract a crusty old merc named Lauder and Kabbah, the heir to an ancient tribal kingdom to do their dirty work. Yet, even though they are initially on the same side, Lauder and Kabbah still have an inexplicable knock-down drag-out fight in the first act, because they are played by Steven Seagal and Mike Tyson. At least the film gets that right. And that’s about it. China Salesman is naked propaganda of the most ludicrous variety. Nothing here rings true here or will shift hearts and minds in the slightest. Perhaps most amusing is Mexican-born Marc Philip Goodman shamelessly hamming it up as the dastardly American, albeit one that speaks with an impenetrable accent that sounds like a Flemish waiter working at a Tapas restaurant in Cypress. Norwegian-born Parisian model Janicke Askevold also looks super-uncomfortable as Susanna, especially when she and Yan are supposed to be developing a romance. Frankly, their chemistry is so iffy, the film is constantly shutting them down and rebooting them. Likewise, Lauder and Kabbah change sides so frequently, we’re guessing Seagal and Tyson kept losing their scripts. This isn’t just schlock, its badly intentioned schlock. However, it can serve a constructive purpose by reminding us of Huawei’s sharp practices and China’s unchecked adventurism in Africa. 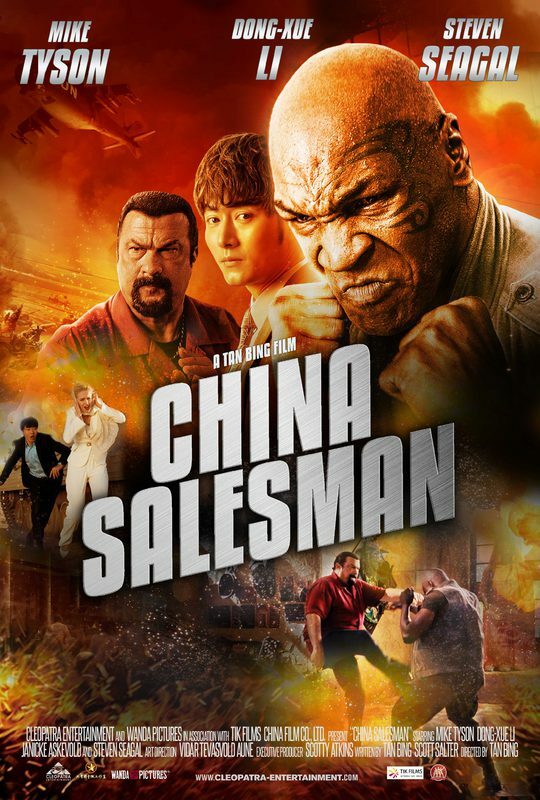 Not recommended (check out Iron Mike in Ip Man 3 and Kickboxer: Retaliation instead), China Salesman opens this Friday (6/15) in New York, at the Cinema Village.